There had been hype about Vivo’s upcoming handset, Vivo V15 Pro for many weeks. It will be the World’s First Smartphone with Pop Selfie Camera of 32MP so the Vivo lovers are quite excited about this upcoming handset. 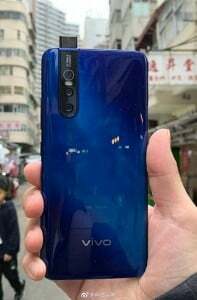 Recently, the Vivo V15 Pro Blue Variant showed up in hands-on-image. 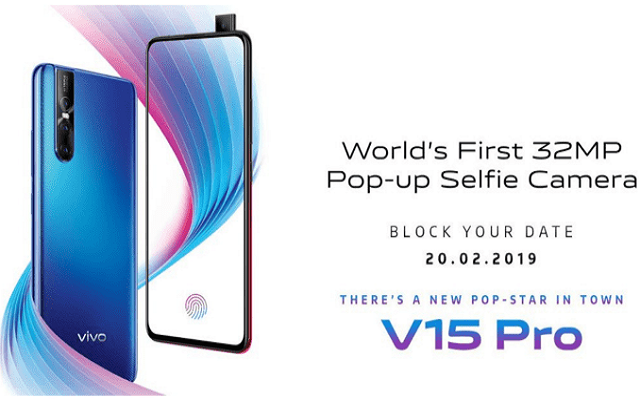 The new Pop Star Vivo V15 Pro will debut on 20 Feb. There had been no words by the company about any other specs yet except its selfie camera one. Let’s have a look at the leaked live image. According to the rumors, the upcoming handset will feature a 6.39″ FHD+sAMOLED Ultra full view display. It will be powered by Qualcomm Snapdragon 675. In addition to that, the phone will have an In-Display Fingerprint Scanner. The phone will come with 6GB of RAM together with 128GB onboard storage. Moreover, the 3700mAh battery is expected to keep the lights on with fast charging support. The phone will sport a 32 MP pop up selfie . It will have a triple camera set up at the rear that will include 48 MP+8MP+5MP cameras. Furthermore, the Vivo V15 Pro Price is expected to be PKR 33,000. It seems to be a budget-friendly phone all packed with some good specs. The phone will go official on Feb 20. So, we will have to wait a few days in order to know everything about this new handset. Vivo is not the only smartphone maker who is launching a device with a pop-up camera. Oppo had already done so and now Samsung is also planning to manufacture pop up camera phone. Samsung Galaxy A90 is expected to be Firm’s First Phone with a pop-up Selfie Camera.